Continuous positive airway pressure (CPAP) nurtures and supports infant breathing by providing respiratory support throughout the respiratory cycle. The application of CPAP maintains the infant's functional residual capacity by helping to prevent airway closure. Maintain infant energy reserves, without the complications associated with endotracheal intubation. The American Association of Respiratory Care (AARC) guidelines recommend the use of heated humidification with infant nasal CPAP. 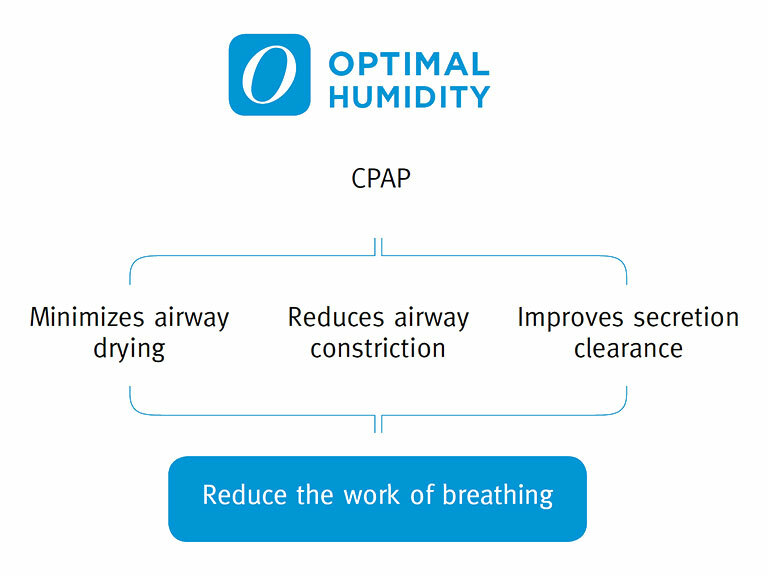 Optimal Humidity (37 °C, 44 mg/L) with CPAP is vital to support an infant’s breathing and protect its developing lungs. These effects combine to reduce the work of breathing.